Nokia CEO Stephen Elop took the stage at a joint event with Microsoft this morning to unveil the next-generation of Windows Phone 8 devices. As expected, their new flagship will be known as the Lumia 920, iterating on its previous model with a 1.5GHz Qualcomm Snapdragon S4 dual core processor, a slightly larger 4.5-inch (768 x 1280) curved glass display, a 2,000mAh battery, and a one-piece polycarbonate body. The company touted the device’s display as the brightest, fastest ever shipped on a smartphone and said they included a technology called super sensitive touch that allows you to use the display with gloves on. The rumors about wireless charging were also confirmed. The phone will be compatible with charging products based on the Qi wireless power standard, and Nokia will make its own charging accessories available too, including a standard plate, a JBL speaker dock, and a Fatboy-branded pillow-style unit. There’s no special cover required either, the wireless charging technology is built right into the handset. Nokia is also incorporating its "PureView" camera technology, but not the 41-megapixel variety. That said the camera will still incorporate hardware image stabilization and impressive low-light capabilities, which company officials have argued that at the end of the day matters more than pure megapixel count. Other specs include, NFC, 1GB of RAM, and 32GB of memory with 7GB of free SkyDrive storage. Beyond hardware specs the company also showed off a handful of software features, including an improved mapping experience with offline maps with turn-by-turn navigation, a commute feature that lets you know when you need to leave based on your transit time, and even indoor maps in Windows Phone 8 to get directions inside places like subway stations. There’s also an augmented reality app called City Lens that layer details about restaurants, buildings, and other venues the smartphone is pointed at. 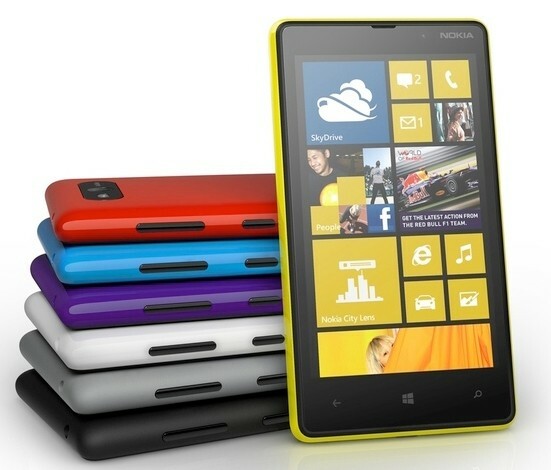 The Lumia 920 will arrive in pentaband LTE and HSPA+ variants and both are expected to ship "in selected markets" later this year in five "vibrant colors" (yellow, red, white, grey, and black). In addition the Lumia 820 will step in as Nokia’s mid-range offering. The phone offers the same 1.5GHz dual-core Snapdragon S4 and 1GB of RAM as the flagship Lumia 920, but with a smaller 4.3-inch WVGA OLED display, 8GB of internal storage (expandable via microSD), and a non-PureView 8-megapixel rear camera. The phone doesn’t support wireless charging out of the box, but Nokia is selling interchangeable covers in a variety of colors that enable that as well as NFC. The Lumia 820 will also launch in "select markets" in Q4.